So is this really the good news it seems to be? Well the answer is (as usual) yes and no. The problem is that behind the positive aggregate data lie the individual national details (you know, the place where the devil is usually to be found), and when we dig down to this level, then we find the position is much more complicated than it seems. Nor should this surprise us, since if a one size fits all interest rate policy didn’t work in the pre 2008 world (just look what happened to Spain and Ireland for heavens sake), is there any good reason to assume that it will in a post 2010 one? 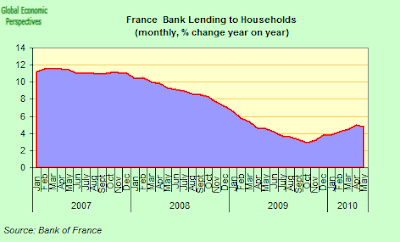 This is not a question of there simply being a credit crunch operative in Spain (which there is), but a different relative levels of indebtedness, since total household debt in Spain is 902 billion euros (or around 90% of GDP), while in France it is just a fraction under 1,000 billion euros (or just a tad over 50% of GDP). 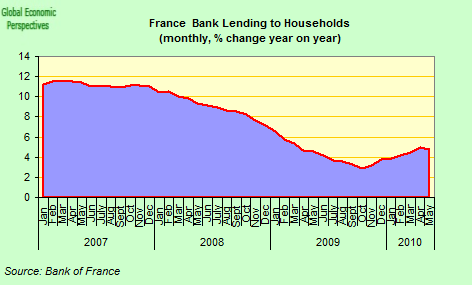 So French households have the capacity to leverage themselves more, while Spanish households are dangerously overleveraged, and herein lies the danger for the ECB, with its single interest rate policy limitation. 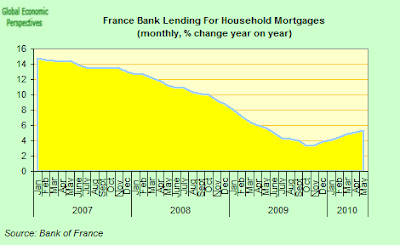 Not raising rates risks fuelling a sizeable consumer credit and construction boom in France, while in Spain raising them (given that in Spain around 90% of mortgages are with variable rates) means flooding the Spanish banking system with non performing loans. So the divergence between these two economies couldn’t be clearer at this point. While house prices continue to fall in Spain. 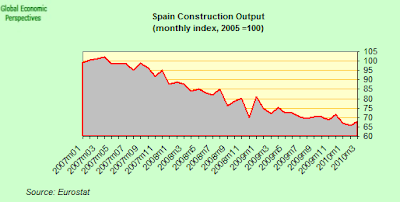 During the key years of the construction bubble negative interest rates were applied to a booming Spanish economy. So what is happening now in France? As can be seen (blue patch at the end), since December last year the French inflation rate has been above the Eurozone 16 one, something that has almost never been the case since the Euro came into existence. 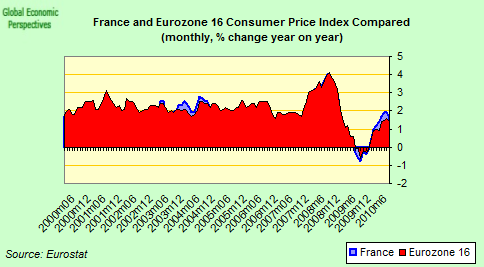 And since almost the same date French interannual inflation has been above the ECB policy rate of 1%. 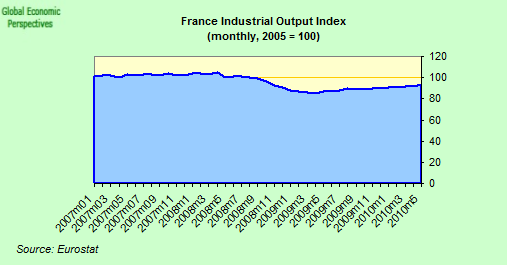 That is to say, negative interest rates are being applied to the French economy. 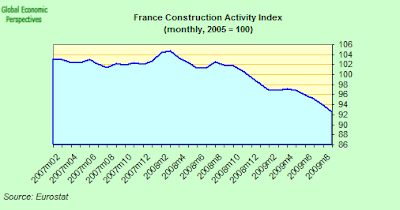 Possibly there was no harm in that while that economy was in the midst of the deepest recession in a decade, but now the French economy is showing clear signs of recovery. 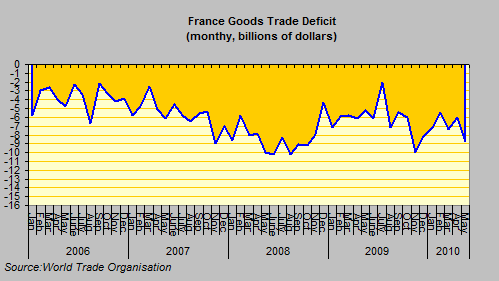 But if we come to look at the French goods trade balance (a sure early warning indicator of problems to come) we can see that the trade deficit is widening again, which basically means that French industry is once more losing competitiveness, and the economy becoming structurally distorted, just as happened to the Spanish economy in its day. 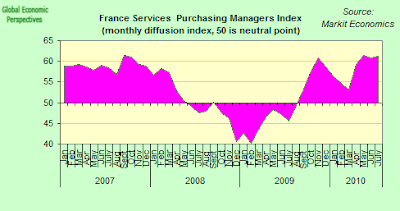 So as Ralph Atkins says, “The pick-up in mortgage lending could offer some cheer after months of gloomy eurozone bank lending data and fears about the stability of the regionâ€™s banking system” – but it could also add to the worries too. 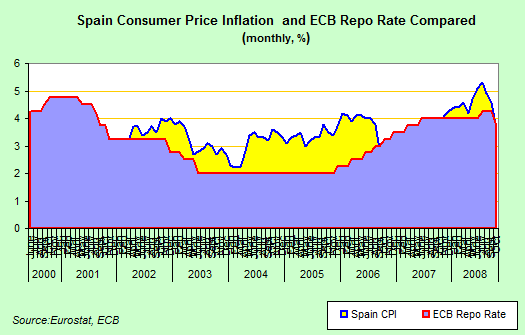 As far as I can see there are only two ways around this problem, either start increasing rates at the ECB, or press for a substantial internal devaluation to restore economic growth in Spain, but both of these routes pose serious issues for the stability of the Spanish banking system, since in the former case the burden of mortgage interest payments becomes excessive (and quickly – simply raising the refi rate from 1% to 2.5% would represent an almost 100% increase in mortgage service costs given the close attachment between Spanish mortgages and 1 year Euribor). One thing is for sure though, some sort of solution or other needs to be found, and soon. Reading what Edward wrote here, this is what I think about this situation. 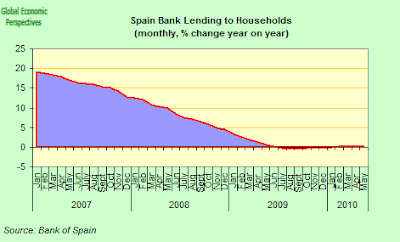 1- Spanish banks are providing the Spanish population in about 90% of the cases, with mortgages which are based on variable interest rates. 2- Interest rates are now at a historically low level. The chance that these extreme low levels will rise in the future is huge. If the interest levels will rise, a lot of Spanish mortgages takers wont be able to pay back their debts to the bank. 3- Spanish bankers as well educated people, are aware of all this. 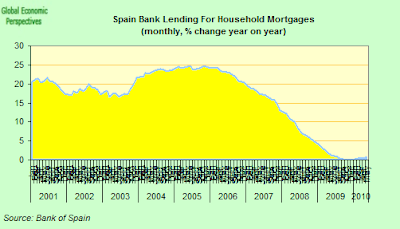 When we consider these facts, of course the following question comes in mind; Why do the Spanish bankers allow so many risk full mortgages, that can bring down their banks on their knees? It would be more logic under the current conditions, when bankers only provide customers with variable interest based mortgages, when their customers have enough income to pay back, even when the interest rate will rise to a more average level. 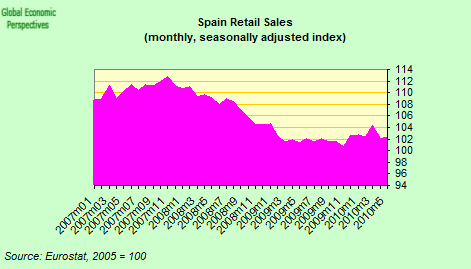 This will, of course, limit the amount of money the customer can lend, and thus bring down the prises of the Spanish real estate. But if the bankers did this in the first place, the Spanish housing bubble was never able to grew so big. The only explanation I can think of, is the bonus system, which provide bankers with huge bonuses when they succeed in selling a lot of mortgages, indifferent of the ability of the customers to pay back their loan. This sick system, that rewards bankers even when they bring the future of their company at risk, was on the bases of the housing bubble in the USA, where everybody who could put his signature under a contract could become a mortgage, indifferent of the fact if they had a steady income. In my opinion, irresponsible bankers and the ones who are responsible for the bonus system, must be judged in court. Because they brought enormous damage to society just to make some extra money. Mind you I say bankers, not banks, for banks are also victims. A nice paper. I wouldn’t, however, draw overextented conclusion from the quite unclear recent trend of France foreign trade, especially in the highly volatile environnement of the world economy. Who knows what will happen in the next few years? 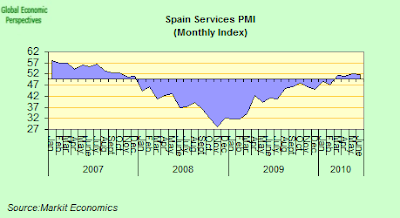 It took several years of an over-accomodative ECB policy in a context of fast economic growth (from Spain point of view) to get the Spanish bubble ans its terrible effects. It seems quite unlikely that such a long-lasting desequilibrium accumulation will occur again soon, for France or for anybody else. Your paper, however, correctly points out the basis problem: monetary policy cannot be at two places in the same time. The Euro experiment is inherently destructive for the countries for which ECB policy is not adapted. 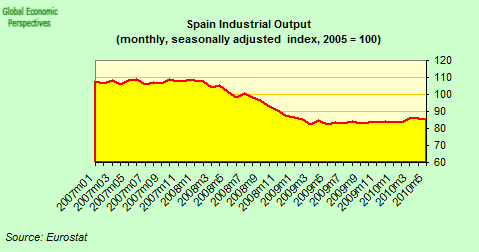 Finally, despite your usual sharpness on demography, you fail to point out the remarkably insane immigration experiment that Spain experimented in the last 10 years or so. The explosion of immigration was both one of the causes and one of the consequences of the housing bubble, in a country with a low birth rate. Difficult economic times will likely turn the experiment into reverse, with a negative feedback loop. 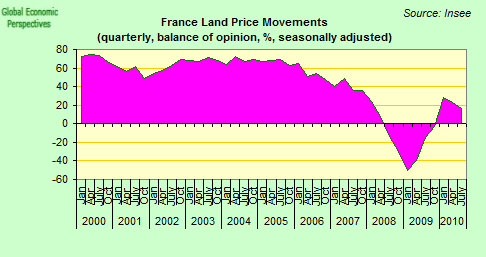 France in contrast is the European country where natural growth has the largest proportion of population increase. Thus wild population movements are less likely. 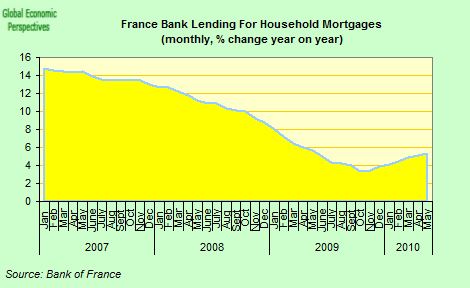 Can you completely equate variable interest Euribor Spanish mortgages with 90% household debt in Spain vs. 50% in France ? 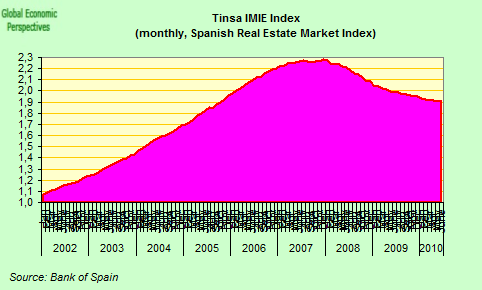 110% mortgage packages by Spanish lenders , and poor lending criteria would seem more the culprit in many cases. To top that off it is the only way they are going to be able to offload their property portfolios now without drastically reducing prices and sending a large part of current lending underwater. 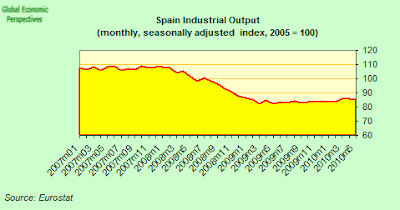 If only they could print money … maybe the mentality of the Cajas is (was) still pre Euro ? Good to know that around 750 billion of Spanish savings are tied into their deposits. The ECB (and French/German banks invested in Spain) will probably be more concerned with stopping the bottom falling out of the Spanish market than the North overheating by a percentage point.